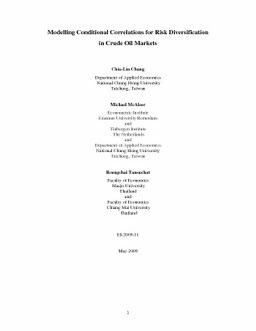 This paper estimates univariate and multivariate conditional volatility and conditional correlation models of spot, forward and futures returns from three major benchmarks of international crude oil markets, namely Brent, WTI and Dubai, to aid in risk diversification. Conditional correlations are estimated using the CCC model of Bollerslev (1990), VARMA-GARCH model of Ling and McAleer (2003), VARMA-AGARCH model of McAleer et al. (2009), and DCC model of Engle (2002). The paper also presents the ARCH and GARCH effects for returns and shows the presence of significant interdependences in the conditional volatilities across returns for each market. The estimates of volatility spillovers and asymmetric effects for negative and positive shocks on conditional variance suggest that VARMA-GARCH is superior to the VARMA-AGARCH model. In addition, the DCC model gives statistically significant estimates for the returns in each market, which shows that constant conditional correlations do not hold in practice.